An avid Liverpool FC fan, I had the pleasure of meeting former goalkeeper Bruce Grobbelaar at "Nøden" pub in Honningsvåg on July 11th, 2009. Bruce Grobbelaar had been invited to North Cape by some local football/Liverpool fans along with David Johnson and Alan Kennedy. However, just after recovering from his bypass surgery, David Johnson hurt himself in Arendal in a football match prior to the events in Honningsvåg. Johnson was substituted at the end into the game with an order from the gaffer, Phil Thompson, to take it easy. So, Bruce explains: He goes up on a corner and makes an attempt on a bicycle kick! Broken ribs etc and a cancelled trip to North Cape was the result. And, Alan Kennedy did not realize that Oslo and North Cape, although both in Norway, is not anywhere near geographically. He had to postpone the trip because the scheduled flight to Oslo made it impossible for him to get to and from North Cape in time for anything. Anyway, Bruce Grobbelaar was enough for me. I had him sign my ”Captains Book” by Steven Gerrard and then Grobbelaar spoke for almost two hours. He talked about his upbringing in Rhodesia. How he served in the army in the apartheid era, how fortunate he was to be talented in sports. In addition to football, he was of national quality in two sports. His goalkeeping skills finally brought him to Anfield Road and European champions, Liverpool FC..
Liverpool FC first took a look at Grobbelaar in the beginning of the 1979-80 season. Nothing happened, so Grobbelaar forgot all about it. Half a year later, the manager Bob Paisley came by himself to watch him play in the USA. After the game, the coach told Grobbelaar that there was somebody who wanted to talk with him. The two men were Geoff Twentyman, perhaps one of the best football scouts ever, and Paisley. Paisley: D-d-d-d-d-d-d-d-d-d want to play f-f-f-f-for Liverpool? Grobbelaar said yes and Paisley left the building. So, Liverpool signed him, and shortly thereafter Grobbelaar traveled from the USA to England. 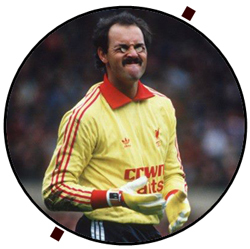 Once in London, Grobbelaar expected somebody from Liverpool FC to be at the airport. But there was nobody there from Liverpool. So Grobbelaar called Liverpool FC and wanted to talk with the manager or somebody in the staff. After a while a secretary answered his call. She told him to come to Liverpool. Grobbelaar had not been to England before and faced a challenge. However, he got himself on a train to Manchester. Once in Manchester, he expected somebody from Liverpool FC to be at the train station, but no. He phoned again, and the secretary told him to come to Liverpool. He grabbed a taxi and got to Lime Street train station in Liverpool. Once again, nobody from Liverpool FC came to pick him up. He called again, and he got an answer that he had to go to Anfield. “???? !,” thought Grobbelaar. By now, it was late and when arriving at Anfield there was nobody around. He grabbed another taxi, and returned to the center of Liverpool and was just about to check into a hotel when Paisley and Twentyman showed up. Paisley - apparently loosing a bet - paid Twentyman a penny and whispered: “I thought he never make it”. This is just one of the stories Bruce Grobbelaar told us an evening in Honningsvåg.